“Words have power. Now is the time to get your point across. With this card, you may also get a clearer direction in the way to proceed. The Third House also represents neighborhoods and siblings. The Third House is the area of the astrological chart that reveals how we think, speak and communicate. It signifies our need to know how we think, speak and communicate. It signifies our need to know and demonstrates how we put our concepts and thoughts into words. You are in search of answers and in need of unlocking mysteries, but your mind is agile and you are able to grasp every detail right now. You may wish to express this mental suppleness through writing, speaking, and researching subject matter which has always intrigued you. Libraries call to you. You may suddenly wake up with an idea that could turn out to be very lucrative. You may even be toying with the idea of writing a book, starting a blog, perhaps a screenplay, or a position at a local news media outlet. There couldn’t be a better time than now. As well as dreamy or imaginative writing and poetry, the Third House also represents dexterity, swiftness, curiosity, and figuring out the mechanisms of what makes things work. So this could mean expressing yourself about something rather technical. The Third House, more than any other, is the house of the mind. Mercury is about giving and receiving information. When this card turns up in a reading, there is a need to uncover all that you can and relate the information to others. Also an area of commerce and sales, when the Third House card presents itself in a reading, it can indicate a time of buying and selling, and becoming involved in retail or transactions made over the Internet. Issues dealing with siblings may come up. There may be questions you must resolve to do with brothers or sisters. Your neighborhood may even be going through some changes. The Third House also signifies your neighborhood, so expect events that will make a difference there. For more in-depth information, look at the surrounding cards. If the Moon card is also in the spread, it might indicate secretive actions carried out at night, perhaps meetings, or even vandalism or burglaries are possibilities. If the Mars card is present, look for noise and radical changes you may not be so happy with. With the Saturn card present, it could mean that an area may start to appear old or decrepit. Also, with the Saturn card, be careful how you put your thoughts and feelings into words. Other persons may not be as warm and receptive to your words and ideas as you hope them to be. This card can also mean you will be talking your way into and out of tough situations. However, you will be mentally able to grapple with issues and sort them out well. Important documents and other paperwork are indicated. This isn’t your everyday type of paper shuffling; the matter will be more significant than the usual. 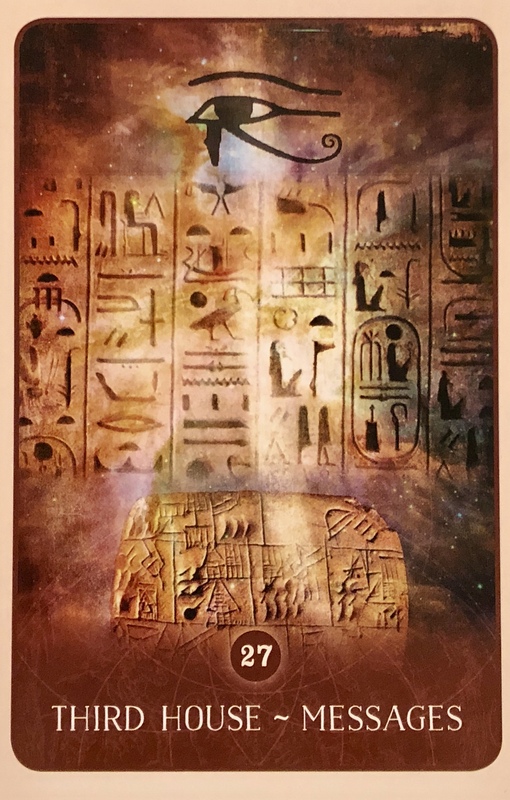 This card also indicates a fortunate time to start a business of your own, perhaps working in translation, creating software, or something to do with deciphering codes and messages, for example. You may also become involved in studying other languages, or anything related to and working toward a common good. If there is something that needs to be said, now is the time to clear the air. Be concise and direct, and do not get wrapped up in emotions or drama. Focus on getting your point across in the most simple and powerful means possible. Mercury is returning direct and we are on the heels of the new moon. Things professed at this time have extra power and will manifest swiftly, so think it through first. You may even want to write down what need to be said in order to be able to see it clearly, read it back to yourself and edit where necessary. Written word is very powerful and allows us the maximum amount of time to really think about what we wish to communicate and how we wish it to be received. Do not let fear hold you back. You are not responsible for the reactions of others, only your action here. Lead with your heart and set the intention that the end result be for the highest good of All involved. Do not use words as weapons, use them as tools. Be absolutely honest, authentic and true to yourself and use your words to heal, transform and empower.